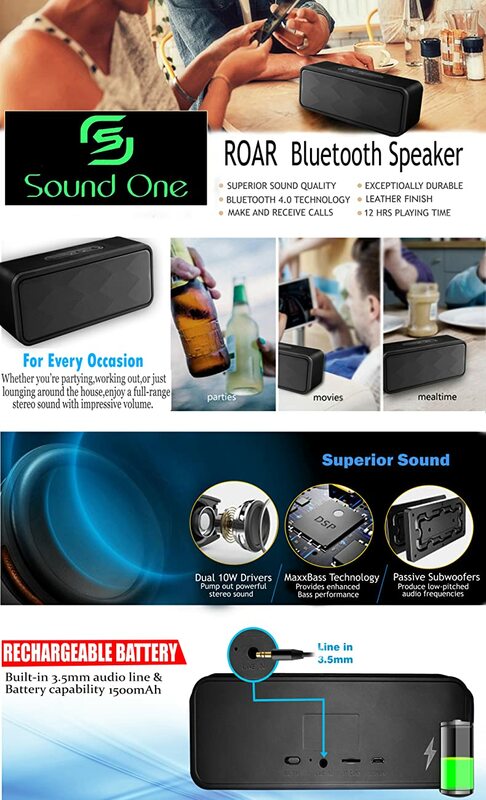 Sound One Roar Bluetooth speaker offers great quality sound with the latest Bluetooth 4.0 technology. It features two highly powerful 40mm total 10W acoustic drivers for excellent sound. With the ultra-compact size and the soft touch rubber design, it can be easily fitted into a backpack, suitcase, or a travel bag. The built-in 1500 mAh rechargeable battery enables an 8-10 hours of playtime on a single charge. This speaker is strong enough to fill up a kitchen, living room, or classroom. It is ideal for personal usage, indoor party or outdoor BBQ or picnic with friends and family. Sound One is a pioneer in portable audio device, providing solutions to professional audio and wireless communication. Sound One always strives for perfection, fashion and simplicity, focusing on revolutionary innovations. !